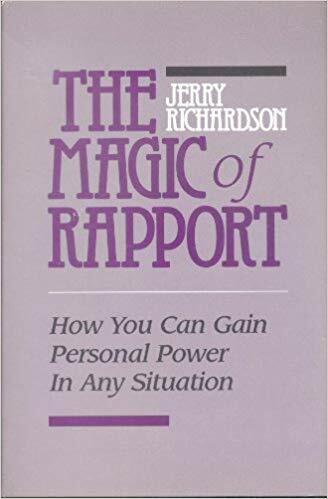 This post is about the nature and power of rapport and how to build and use rapport to influence and persuade others, at all times with integrity. Importantly, using rapport is notabout being manipulative. Do you remember your parents’ or perhaps grandparents’ copy of Dale Carnegie’s 1936 How to Win Friends and Influence People best seller on their bookshelf? The book and related tools still sell strongly today because Carnegie tapped deep, enduring aspects of humanity and packaged his message in accessible and actionable ways. whatyou communicate. This helps you move from your map of the world into the other’s map so that you share a common space of closeness and togetherness. 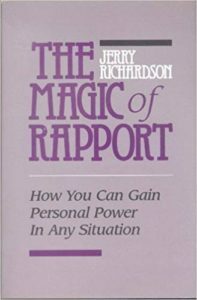 Jerry Richardson has written an excellent book, The Magic of Rapport, on which I draw in this post. If your professional success and personal satisfaction depends your ability to influence others to get what you want, then you need to know how to use rapport. And finally, you avoid being manipulated. Put another way, when you are in a state of rapport with another person you are aligned, your verbal and non-verbal communication is easy and harmonious, you have an affinity with each other, and you like each other as people. Some may be asking, isn’t this a (not so) subtle form of manipulation? If by ‘manipulation’ you mean a scheming, underhand means of getting your way, this is notrapport. But if by ‘manipulation’ you mean skilful use of communication to achieve an outcome that is values-based and where – in your conscience – you are acting with integrity, then rapport is manipulation. Pacing and leading and the way they interact are the key skills are involved in building rapport. Pacing is the process by which, at an unconscious level, you create similarities that establish a bridge of commonality between two or more people. To be successful, pacing must be outside the consciousness of the other person and done in a way that respects them and their privacy, i.e. with integrity. Pacing means meeting the other person where she or he is, reflecting what she or he knows or assumes to be true, and/or matching an aspect of their experience. There are many ways to do this. You can pace their mood (upbeat or sombre), body language (reserved or gesticulating), speech (slow and deliberate or rapid and animated) and imagery they use (doom and gloom or sunny joy). As the diagram shows, non-verbal cues are by far the largest contributor to the matching of the ‘tone of voice’ (gentle or strident) and ‘physiology’ by which is meant how you stand (upright and confident or slouched and down) or how you position your upper limbs (arms tightly folded or hands softly clasped). In moments of intense rapport two people mirror each other by for example, shifting their weight from one foot to the other or touching their hair at exactly the same time. All of us mirror to some degree, usually unconsciously, but remember you can learn to mirror consciously and build rapport deliberately. Having paced the other person, the question is ‘Will they follow your lead?”. You have built the bridge by successful pacing, now you must lead them over the bridge. Leading means you get the results you want, whether these be going in a new direction, implementing a fresh idea, adopting novel ways of thinking and/or behaving in different ways. If rapport has been established by pacing, then you’ve earned the permission to lead. If the others don’t follow, it’s result of having too little rapport; you haven’t done sufficient pacing. All too frequently in our enthusiasm we lead with logic before building rapport. Doing this creates resistance and our ideas fall on deaf ears, closed minds and unwilling hearts. Push harder and you only increase the resistance. Even with rapport established, your attempts to lead may fail because your deliberate leading injects an element of difference, disruption into the interaction. When this happens, be sensitive to the other’s responses. 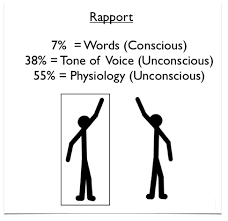 If rapport has been interrupted go back to pacing, to emphasising similarity. All is not lost, pacing and leading are a dynamic duo. Being adept at building rapport is like learning to dance with your partner: Practice and more practice. My post Influence without authority is another useful resource on this subject. Consulting. You can also find Margaret on LinkedIn.